Focused Management provides a system view and touches upon issues of performance measures, operations management, quality, cost-accounting, pricing, and above all, value creation and value enhancement. Its main theme is that one can do much more with the existing resources in terms of throughput, response time and quality. valuable for business organizations as well as for not-for-profit organizations, in service, manufacturing, hi-tech, financial services, retail, and communication companies. 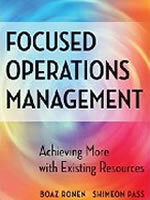 The book includes the use of methods such as the Theory of Constraints (TOC) that yields fast results, and demonstrates how simple tools like the Focusing Table, the Focusing Matrix, the Complete Kit concept and applications of the Pareto Analysis can increase throughput, reduce response time and create value.